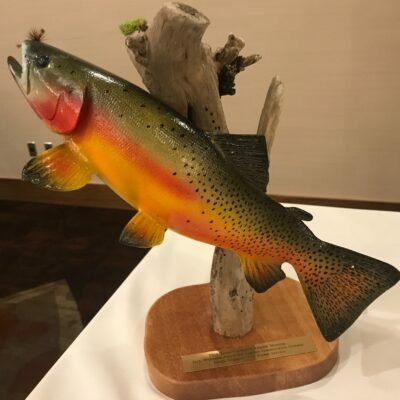 Recent projects to remove in-stream barriers on two North Carolina streams have opened miles of habitat for trout and other creek-dwelling creatures. 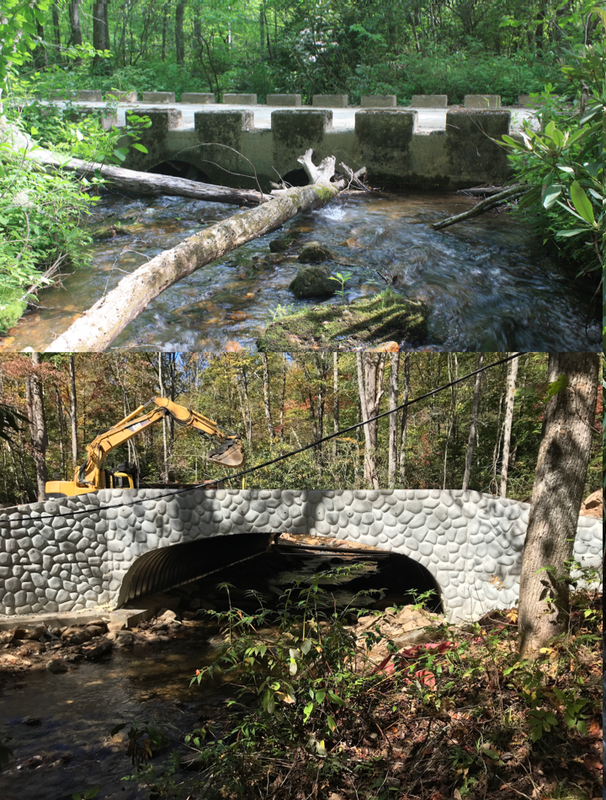 The work was completed on Powdermill and Cedar Rock creeks and is part of TU’s coldwater conservation program in the Southern Appalachians. 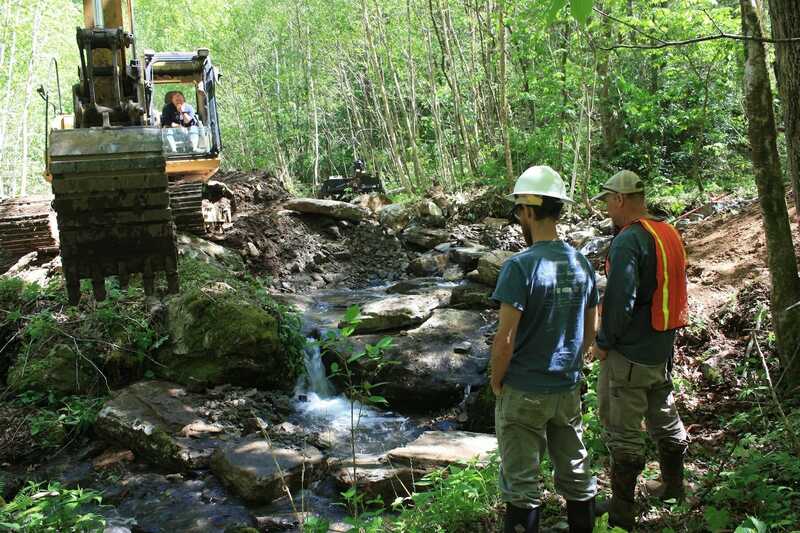 Removing barriers helps fish, including native brook trout, access diverse habitat and is critically important as aquatic species face a variety of challenges, including a warming climate. The Powdermill Creek project (above) is located just one drainage over from TU’s Roaring Creek site in the Roan Highlands. This project was on N.C. State Parks property and was constructed in partnership with the N.C. Wildlife Resources Commission. It involved the removal a perched, clogged and undersized culvert and stabilizing the instream channel to native reference conditions and re-grading the banks to eliminate bank constriction and potential for failure and sedimentation. This project cost $35,420, not including design costs. TU’s design and construction team included: Wildlands Engineering, the N.C. Wildlife Resources Commission and Todd Hodges Construction. Funders included: N.C. Wildlife Resources Commission, N.C. Division of Parks and Recreation, and Wildlife Conservation Society. The Cedar Rock Creek project (before/after above) is in Transylvania County on national forest system lands in the Pisgah Ranger District in Pisgah National Forest and in Catheys Creek watershed in the Upper French Broad River basin. The Catheys Creek drainage is categorized as a top 1 priority watershed for restoration by the U.S. Forest Service, and has been prioritized by TU as a “secure and restore persistent populations” catchment. 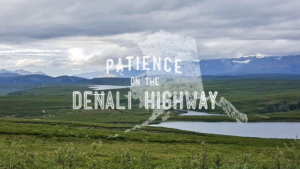 The project involved removal of concrete low water ford with two embedded 24-inch diameter x 30-foot-long culverts and replacement with a bottomless culvert with a new span of 18 feet. This project was located on a State of N.C. road and required stringent design and construction standards to meet the public vehicular demands. TU was able to bring $53,417 from the Duke Energy Water Resources Fund and U.S. Fish and Wildlife Service to help cover costs, which totaled $297,000. The design was performed by U.S. Forest Service engineers and construction was performed by Galbreath Contractors and Jerry Williams Construction. 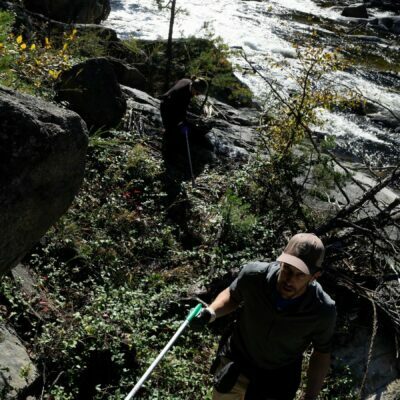 In preparation for the future, TU worked with staff from U.S. Forest Service and N.C. Wildlife Resources Commission to compile ecological and socio-cultural data to develop a focal area that has significant coldwater conservation needs and the pragmatic partnership opportunities to pay for this work. This resulted in what is being called the Sky Island Coldwater Conservation Planning Area, which includes the Upper Tuckesegee, Upper French Broad and Upper Pigeon River watersheds. TU in the Southern Appalachians will concentrate efforts in western North Carolina for the next 10 to 15 years, while also not ignoring excellent coldwater conservation opportunities elsewhere in the state. Maintaining solid relations with TU chapters and councils has also been a high priority. The TU Coldwater Conservation Manager for the Southern Appalachians has been visiting with and speaking with numerous chapters in North Carolina, South Carolina and Tennessee. Plans are underway to involve chapter members in various citizen science assessments in Sky Island and elsewhere in the southern Appalachians in 2018 and beyond. Andy Brown is the stream restoration manager in Trout Unlimited’s Southern Appalachian Region. He is based in Asheville, N.C.